DIY Biking | How bike builds, bike travel and bike life can save the world: My feature on Good Karma Bikes is in Urban Cyclist Magazine! 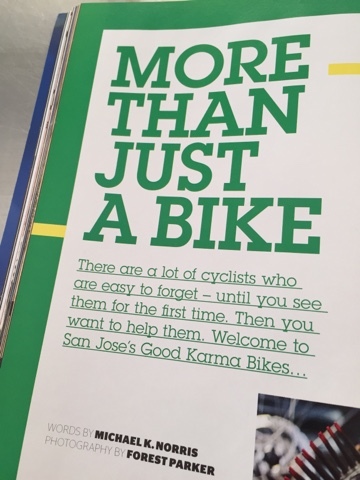 My feature on Good Karma Bikes is in Urban Cyclist Magazine! Great news from San Jose! Not only did the Willow Glen Road Diet pass unanimously (and is now permanent) a feature I wrote about Good Karma Bikes has been published in Urban Cyclist magazine. Buy the May/June issue at your local newsstand and read about Good Karma Bikes - and marvel at the outstanding photos by Forest Parker. And read about Vince, who is both a homeless man and a volunteer at Good Karma Bikes I interviewed for the story (and am thankful to the editor my sidebar about him made the cut). 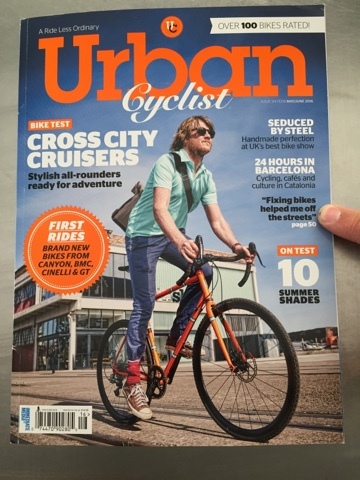 Urban Cyclist is a UK magazine so it may not be available everywhere - you'll probably find it at Barnes & Noble - which is a good bookstore despite the fact they ignored advice I gave them four years ago that would have saved them tens of millions of dollars. I hope the piece inspires people to think about who they share the road with and maybe, just maybe, create a way to use bikes to help homeless people in their town. Thanks for reading and thanks for riding.